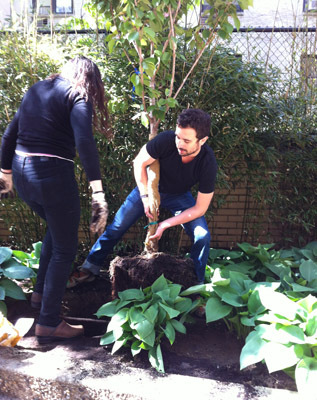 Lang alumni Philip Silva and Erica Schapiro-Sakashita planting a tree in the stuy-town dorm buildings backyard. The New School has just been named a Tree Campus USA school, a national program created in 2008 to honor colleges and universities for effective campus forest management and for engaging staff and students in conservation goals. It may seem unusual for an urban campus to win such a distinction, but not when you consider who was behind the effort. The university sustainability staff and students in the Urban Forestry Club committed to achieving this title despite being an urban campus with next to no grounds. Both the curriculum and student interests guided the effort. With the help of a New School Green Fund grant in 2012, and in partnership with the university’s facilities management office, their goals were rewarded when The New School was named the first Tree Campus USA school in Manhattan by the Arbor Day Foundation last week. The New School achieved the title by meeting Tree Campus USA’s five standards, which include an Arbor Day observance, a student service-learning projects, maintaining a tree advisory committee, a campus tree-care plan, and a tree care budget. Reaching those five standards started last April on Arbor Day when students and staff from The New School and students from New York University oversaw the planting of four trees at the Stuyvesant Park Residence, one of the five locations trees are scheduled to be planted. The university’s landscape contractor planted even more trees at Loeb Hall, the David M. Schwartz Fashion Education Center at 560 Seventh Avenue, 13th Street Residence Hall, and the 20th Street Residence Hall. Also on that day Lang Environmental Studies alumna Sophie Plitt of the NY Restoration Project led a student service-learning workshop thus achieving two of the required goals. The Tree Campus USA application was completed through a coordinated effort from Leila Mougoui Bakhtiari, a Parsons BS in Environmental Science alumna and former Urban Forestry Club president, and Trey Townsend, a current Lang student.